Nurianna Thoha got a Doctoral degree in Business Administration from Curtin University, Perth, Western Australia in 2006. 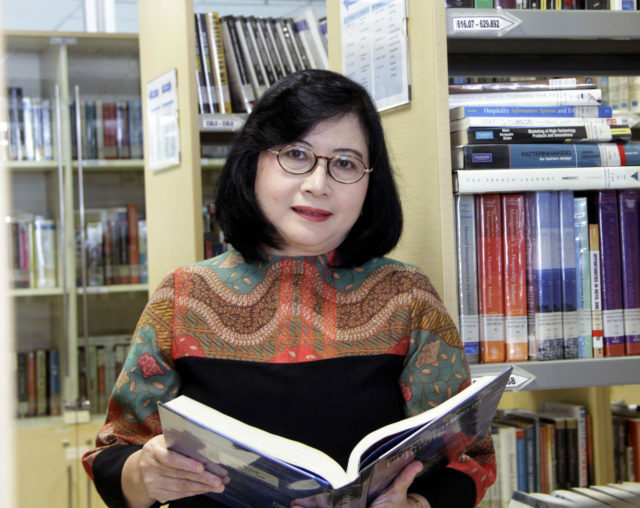 She got a Bachelor Degree in Agro economics from Bogor Agriculture Institute, Indonesia in 1985 and her MBA degree from University of Oregon, USA in 1989. Most of her 28 year career has been spent with Education institutions and Consulting companies in Indonesia. She had teaching experience in wide range of subjects in human resources management, leadership and organizational behavior, and qualitative research at different education levels. She worked at School of Business and Management/SBM ITB as a lecturer and administered Executive MBA Programs at SBM ITB Jakarta campus for four years. She had done some research and wrote articles and papers on Human Resource Management practices in Indonesia, Generation Y motivation, and on Qualitative Research Method and presented them widely at international conferences and seminars. Nurianna’s experience in dealing with Government of Indonesia officials has been extensive through her four year engagement with 12 Government of Indonesia Institutions (Ministries and other institutions) and five provincial areas (Aceh, Papua, West Papua, East Nusa Tenggara, and West Nusa Tenggara) while she worked at Australia Awards (previously was known as Australian Development Scholarships) as the Human Resource Development National Manager. Currently she works as a faculty member at International Business/Faculty of Business, BINA NUSANTARA University. During the last two years, in July, she was invited as a visiting Professor for Hanyang University International Summer Program in Seoul, South Korea. Sarjana in Agribusiness (with Honour), Bogor Agriculture University, Indonesia, 1985. Master of Business Administration, University of Oregon, Eugene, Oregon, USA, 1989. Doctor of Business Administration, Curtin University, Perth, Australia, 2006. Thesis Topic: The Transition from Personnel Administration to Strategic Human Resource Management Practices in Large Indonesian Companies: Barriers and Enablers. Internal research grant from Bina Nusantara University, 2017, for my research entitled: Investigating the Perception of Generation Y on the Relationships of Vroom’s Motivation Theory. Internal research grant from Bina Nusantara University, 2016, for my research entitled: The Relationship among Elements of Organization and Leadership in the Process of Producing Research and Innovation in Higher Education Institutions in Central Java. Internal research grant from Bina Nusantara University, 2015, for my research entitled: Students’ Perception on Teaching Quality of Expatriate and Indonesian Lecturers at International University in Jakarta, Indonesia. CBS Journal Article Conversion Grant – Round 2, 2005 ($2000) – Curtin University of Technology, Perth, Australia, for my paper: Thoha N and A Whiteley (2005), Linear and Non-Linear Systems within the HRM Framework: an Indonesian Study. Thoha N. & Lubis A. T. (2016) “Students’ Perception on Teaching Quality of Expatriate and Indonesian Lecturers in International University in Jakarta, Indonesia “ will be published in International Journal of Economic Research – ISSN: 0972-9380 : Scoups Index Journal and JEL Index, print + online publication in Vol.13 no: 1 (2016) issue. Indriati F., TjakraatmadjaH, Rudito B, & Thoha N. (2015) “Exploring Lecturers’ Antecedents and Barriers to Knowledge Sharing Behavior” will be published inInternational Journal of Economic Research – ISSN: 0972-9380: Scopu​s Index Journal and JEL Index, print + online publication in Vol.12 no: 4. Indriati F., Tjakraatmadja, J.H., Rudito B., & Thoha N. (2015) “Measuring the effect of Equality Matching Relationship on Lecturer’s Knowledge Sharing Behavior” published inMediterranean Journal of Social Sciences Vol 6 No 6 November 2015. (http://www.mcser.org/journal/index.php/mjss/issue/view/185). Thoha N., & Hutapea, P. (2015) “Familiarization Studies: Critical Components in Conducting Successful Fieldwork” Published in Advanced Science Letters, 1 April 2015, vol. 21, no. 4, pp. 667-671(5) DOI: http://dx.doi.org/10.1166/asl.2015.5945(http://www.ingentaconnect.com/content/asp/asl/2015/00000021/00000004/art00020?token=00441a86c09de8441c7b76504c486667255c23792f536c632d386a333f25764eca2a). P. Hutapea, & Thoha N. (2013) ”Praktek Complex Adaptive Sysem (CAS) pada Pabrik Gula di Lampung” published in Jurnal Manajemen, vol 3 No.1, p 60-75. ISSN: 2089-3477. Thoha N., Hutapea P., & Whiteley A. (2006) “The Emergence of Non-Linear Theory in Human Resource Management” Published in Jurnal Manajemen Teknologi, Volume 5, Number 2, p. 93-107. Thoha N., Bickley M & Whiteley A. (2006) “HRM Transition in Indonesian Companies: Linear and Non-Linear Approaches” Published in International Review of Business Research Papers Journal, Volume 2, Number 1, p. 1-15, 2006. (Can be accessed atbizresearchpapers.com.htm, May 2006 edition). Thoha N. (2005) “The Barriers and Enablers to the Transition from Personnel Administration to Strategic Human Resource Management Practices: A Study of Large Indonesian Companies” Published in Journal of Contemporary Issues in Business and Government Volume 11, Number 2, p. 51-64. Thoha N, Rasidi, D, A (2018) “Vroom’s Motivation Theory: Gen Y’s Perception” published in proceedings of IMHA 2018 conference, Jakarta, 3-4 September 2018. Thoha N., Avandana, I.M.N.W, (2018) “Project Managers’ Leadership Styles and Their Effects on Project Management Performance” published in proceedings of IMHA 2018 conference, Jakarta, 3-4 September 2018. Thoha N., Setiawan, S., B. (2018) “Culture, Leadership Behavior and Their Relationships to Organizational Performance” published in proceedings of IMHA 2018 conference, Jakarta, 3-4 September 2018. Thoha N, Rasidi, D, A (2017) “Investigating the Perception of Generation Y on Vroom’s Motivation Theory”, published in proceedings of the 2017 International Multidisciplinary Conference on Productivity and Sustainability, Jakarta, 5-7 December 2017. Thoha N, Rasidi, D, A (2017) “Discovering The Relationship Among Vrooms’ Motivational Factors Perceived by Generation Y (A Case Study in Corporate Service Organizations Within the Greater Jakarta Area, Indonesia)”, published in proceedings of the 5th Global Conference on Business and Social Sciences, Kuala Lumpur, Malaysia, 4th-7th May. ISBN: 978-967-13147-0-8. Avandana, I.M.N.W, Thoha N (2016) “The Effect of Project Managers’ Leadership Styles on Project Management Performance (Case Study on PLTU XYZ 2 X 30 MW)” published in proceedings of the 4thGadjahMada International Conference on Economics and Business (GAMAICEB), Yogyakarta, Indonesia, 25-27 November 2016. ISSN 2548-7965. Tan, B.S.C, Thoha N (2016) “Exploring Workplace Motivational Factors Perceived by Generatoion Y to Work as Future Talent in Companies in Indonesia (A Case Study of Undergraduate Students in Greater Jakarta Area)” published in proceedings of the 4thGadjahMada International Conference on Economics and Business (GAMAICEB), Yogyakarta, Indonesia, 25-27 November 2016. ISSN 2548-7965. Thoha N, A T Lubis (2016) “Students’ Perception on Teaching Quality of Expatriate and Indonesian Lecturers in International University in Jakarta, Indonesia “ will be published in International Journal of Economic Research – ISSN: 0972-9380 : Scoups Index Journal and JEL Index, print + online publication. Indriati F, Tjakraatmadja, J.H, Rudito B, Thoha N (2016) “An Integrated Theoretical Framework of the Antecedents of Knowledge Sharing Behavior among Lecturers” published in Jurnal Sains Humanika – ISSN: 2289-6996 Vol 8:1–2, p. 25–31. Thoha N, P Hutapea (2014) “Familiarization Studies: Critical Components in Conducting Successful Fieldwork” Published in proceedings of the International Conference on Management, Hospitatily & Tourism, and Accounting – IMHA, Bandung, Indonesia, September 3-4. P Hutapea, Thoha N (2013) ”Praktek Complex Adaptive Sysem (CAS) pada Pabrik Gula di Lampung” published in Jurnal Manajemen, vol 3 No.1, p 60-75. ISSN: 2089-3477. Thoha, N (2009) “Antara Kompetensi dan Emotional Intelligence” Published in Human Capital Magazine, Special Edition: 5th Anniversary, p.41. Thoha N, (2007) “Interviewing in Bahasa Indonesia for an Australian PhD: Transcription and Translation Issue” Published in proceedings of the 4th International Qualitative Research Convention, Malaysia, September, 3-5. Thoha N, P Hutapea, (2007) “The Impact of Asian Financial Crisis on HRM Practices in Indonesia” accepted but not presented at 10th International Conference on Global Business and Economic Development, Kyoto, Japan, August 8-11. Thoha N, P Hutapea, A Whiteley (2006) “The Emergence of Non-Linear Theory in Human Resource Management” Published in Jurnal Manajemen Teknologi, Volume 5, Number 2, p. 93-107. Bickley M and N Thoha (2006) “HRM Transition in Indonesian Companies Following the Asian Financial Crisis” Published in proceedings of International Strategic Management Conference Istanbul, Turkey, June 8-10. Thoha N, M Bickley and A Whiteley (2006) “HRM Transition in Indonesian Companies: Linear and Non-Linear Approaches” Published in International Review of Business Research Papers Journal, Volume 2, Number 1, p. 1-15, 2006. (Can be accessed at www.bizresearchpapers.com.htm, May 2006 edition). Thoha N (2005) “The Barriers and Enablers to the Transition from Personnel Administration to Strategic Human Resource Management Practices: A Study of Large Indonesian Companies” Published in Journal of Contemporary Issues in Business and Government Volume 11, Number 2, p. 51-64. Thoha N, M Bickley and A Whiteley (2005) “HRM Transition in Indonesian Companies: Linear and Non-Linear Approaches” Published in proceedings of International Business Research Conference, Sydney, Australia, Dec 5-8. Thoha N (2005) “The Barriers and Enablers to the Transition from Personnel Administration to Strategic Human Resource Management Practices: A Study of Large Indonesian Companies” Published in proceedings of National Business Student Research Conference, Perth, Australia, Nov 10-11. Thoha N and M Bickley (2005) “The Transition from Personnel Administration to Strategic Human Resource Management Practices in Large Indonesian Companies: Barriers and Enablers” Published in proceedings of ACREW Conference, Melbourne, Australia, June 24-25. Thoha N (2010) “Challenges in Achieving Gender Balance within ADS Applications” Joint International Seminar – Women in Local Governance and Its Contribution to Good Governance: Challenges and Models to Global Governance, Universitas Muhammadiyah, Yogyakarta, Indonesia, 15 October. Hutapea P and N Thoha (2008) “The Practice of Complex Adaptive System (CAS) in Indonesia and Its Implication towards Organization Management” Seminar Nasional Manajemen Bisnis Indonesia ke 2, Prasetya Mulya Business School, Jakarta, Indonesia, 7-8 May. Thoha N and Firman A.F (2007) “Qualitative Research for PT Asia Global Media (ANTV)” CCE Sampoerna SBM ITB, Jakarta, Indonesia, 10 and 24 February. Hutapea P and N Thoha (2001) “Human Resource Concept and Implementation for Line Managers” Best Orgz Solusi Seminar, Ibis Hotel, Jakarta, Indonesia, September 19. Hutapea P and N Thoha (2001) “How to Conduct Job Evaluation?” Best Orgz Solusi Seminar, Sahid Hotel, Jakarta, Indonesia, June 10. Hutapea P and N Thoha (2001) “Building Foundation and Deciding Strategy to Achieve Optimal Organisation” Best Orgz Solusi Seminar, Sahid Hotel, Jakarta, Indonesia, May 21. Hutapea P and N Thoha (2001) “Performance Management to Increase the Achievement of Job’s Target” Best Orgz Solusi Seminar, Sahid Hotel, Jakarta, Indonesia, March 23. Hutapea P and N Thoha (2001) “Deciding Salary Policy to Overcome the Increase of Minimum Regional Wage (UMR)” Best Orgz Solusi Seminar, Sahid Hotel, Jakarta, Indonesia, March 19. Hutapea P and N Thoha (2001) “How to Conduct Competency Based Interview” Best Orgz Solusi Seminar, Sahid Hotel, Jakarta, Indonesia, March 6-7. Hutapea P and N Thoha (2001) “Tips for Job Interview Preparation” Job Expo Seminar, Jakarta Hilton Convention Center (JHCC), Jakarta, Indonesia, February 23. Hutapea P and N Thoha (2001) “Salary and Compensation Management” Best Orgz Solusi Seminar, Sahid Hotel, Jakarta, Indonesia, February 7-8. Hutapea P and N Thoha (2001) “How to Write Job Description?” Best Orgz Solusi Seminar, Sahid Hotel, Jakarta, Indonesia, February 5-6. Hutapea P and N Thoha (2001) “Job Analysis” Best Orgz Solusi Seminar, Sahid Hotel, Jakarta, Indonesia, February 5-6. Hutapea P and N Thoha (2001) “Competency as an Element in Integrating Human Resource System” HRD Club Seminar, Jakarta Design Center, Jakarta, Indonesia, February 2. Hutapea P and N Thoha (2000) “Performance Management” Best Orgz Solusi Seminar, Sahid Hotel, Jakarta, Indonesia, Nov 20-21. Thoha N, Rasidi, D, A (2018) “Vroom’s Motivation Theory: Gen Y’s Perception” presented at IMHA 2018 conference, Jakarta, 3-4 September 2018. Thoha N., Setiawan, S., B. (2018) “Culture, Leadership Behavior and Their Relationships to Organizational Performance” presented at IMHA 2018 conference, Jakarta, 3-4 September 2018. Thoha N, Rasidi, D, A (2017) “Investigating the Perception of Generation Y on Vroom’s Motivation Theory”, presented at the 2017 International Multidisciplinary Conference on Productivity and Sustainability, Jakarta, 5-7 December 2017. Thoha N, Rasidi, D, A (2017) “Discovering The Relationship Among Vrooms’ Motivational Factors Perceived by Generation Y (A Case Study in Corporate Service Organizations Within the Greater Jakarta Area, Indonesia), presented at the 5th Global Conference on Business and Social Sciences, Kuala Lumpur, Malaysia, 4th-7th May. Avandana, I.M.N.W, Thoha N (2016) “The Effect of Project Managers’ Leadership Styles on Project Management Performance (Case Study on PLTU XYZ 2 X 30 MW)” presented at the 4thGadjahMada International Conference on Economics and Business (GAMAICEB), Yogyakarta, Indonesia, 25-27 November 2016. Tan, B.S.C, Thoha N (2016) “Exploring Workplace Motivational Factors Perceived by Generatoion Y to Work as Future Talent in Companies in Indonesia (A Case Study of Undergraduate Students in Greater Jakarta Area)” presented at the 4thGadjahMada International Conference on Economics and Business (GAMAICEB), Yogyakarta, Indonesia, 25-27 November 2016. Thoha N, P Hutapea (2014) “Familiarization Studies: Critical Components in Conducting Successful Fieldwork” presented at the International Conference on Management, Hospitatily & Tourism, and Accounting – IMHA, Bandung, Indonesia, September 3-4. Thoha N (2007) “Interviewing in Bahasa Indonesia for an Australian PhD: Transcription and Translation Issue” presented at the 4th International Qualitative Research Convention, Malaysia, September 3-5. Bickley M and N Thoha (2006) “HRM Transition in Indonesian Companies Following the Asian Financial Crisis” presented at the International Strategic Management Conference Istanbul, Turkey, June 8-10. Thoha N and A Whiteley (2005) “Linear and Non-Linear Systems within the HRM Framework: An Indonesian Study” presented at ANZAM Conference, Canberra, Australia, December 7-10. Thoha N, M Bickley and A Whiteley (2005) “HRM Transition in Indonesian Companies: Linear and Non-Linear Approaches” presented at the International Business Research Conference, Sydney, Australia, December 5-8. Thoha N (2005) “The Barriers and Enablers to the Transition from Personnel Administration to Strategic Human Resource Management Practices: A Study of Large Indonesian Companies” presented at the National Business Student Research Conference, Perth, Australia, November 10-11. Thoha N (2005) “Issue of Interviewing in Bahasa Indonesia for an Australian PhD” presented at the National Business Student Research Conference, Perth, Australia, November 10-11. Thoha N (2005) “The Transition from Personnel Administration to Strategic Human Resource Management Practices in Large Indonesian Companies: Barriers and Enablers” presented at the International Workshop for Research Students in Employment and Work, Melbourne, Australia, June 23. Hutapea P. & Thoha, N. (2008), “. Kompetensi Plus: Teori, Desain, Kasus, dan Penerapan untuk HR dan Organisasi yang Dinamis”, published by PT Gramedia Indonesia in September 2008. (in English:“Competency Plus: Theory, Design, Cases, and Its Application for HR and Dynamic Organization”). Thoha N. & Bickley M. (2005) “The Transition from Personnel Administration to Strategic Human Resource Management Practices in Large Indonesian Companies: Barriers and Enablers” Shifting the Boundaries of Employment and Work Conference, Australian Centre for Research in Employment and Work (ACREW), Melbourne, Australia, June 24-25.